the different names that this delicious dish goes by. 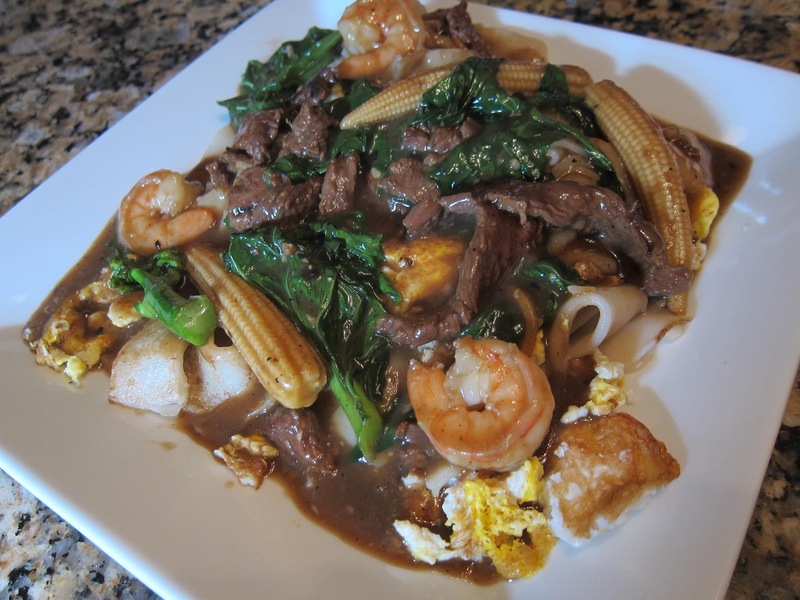 This tasty rice noodle dish with gravy is a staple in every Cambodian, Vietnamese, Thai and Laotion restaurant in Lowell. The soft wide rice noodle is also used in the popular Thai "phad see you" dish or the "drunken noodles"which is on the spicier side. This recipe is influenced by my mom as I would watch her make this dish for my siblings an I on a regular basis while growing up in the Srey household. All the ingredients can be found at a local Asian Store. Dishes can be prepared with a variety of meat, seafood or combination of meat and seafood, called,"Special". This dish is also delicious served vegetarian with tofu and extra vegetables. In Cambodian cooking, there is no measuring.. just tasting to perfection. 2 bunches of Chinese broccoli, washed and chopped. Cut the rice noodles in 1 inch strips. Approximately 5-6 strips. If noodles were purchased from a fridge, place the cut up strips in a microwave safe bowl with a lid and heat for 2 minutes to soften noodles. Set aside to cool. If noodles were purchased at room temperature, gently peel the the noodles from its layers without breaking the noodle strips. Heat a medium size wok and spray with cooking spray. Cook one egg, sunny side up, gently breaking the yoke towards the end. Add 2 cups of peeled noodles to the wok. Add a dash of soy sauce, soy bean sauce, thick sweet soy sauce and oyster sauce to the noodles, carefully tossing the noodles so they don't break. Heat a large wok on high temperature until cooking surface is hot. Add a tablespoon of oil and add raw meats. Add a tablespoon of oyster sauce, a pinch of salt and a tablespoon of fried garlic. 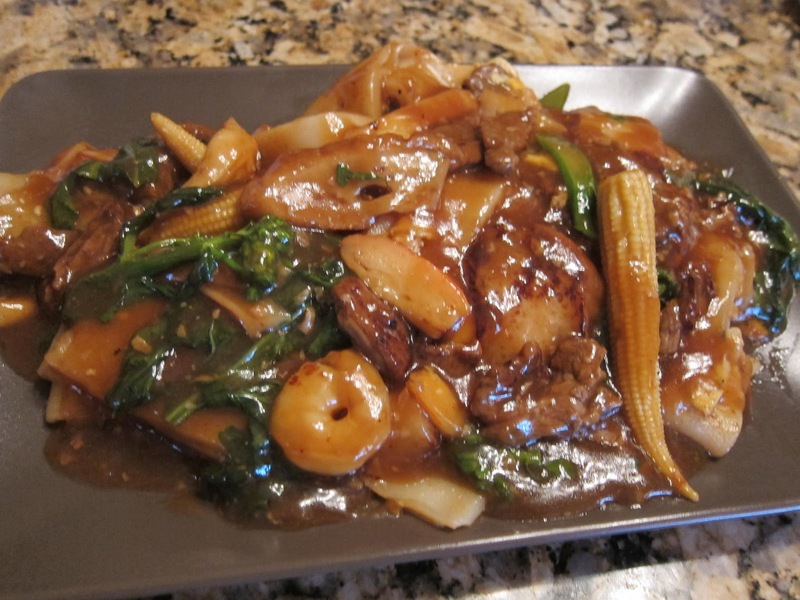 After the meats are cooked, add the seafood, mushrooms and baby corn. Continue to stir fry using a wooden spoon or a spatchler. In a separate bowl, mix the water and cornstarch until the powder dissolves. Add the mixture into the heated wok. 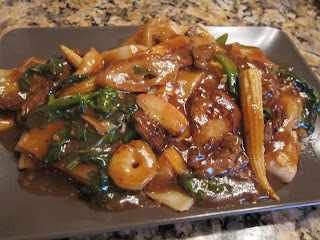 Add 1 tablespoon of sugar, 1 tablespoon of rice vinegar, 1 tablespoon of fried garlic, 3 tablespoons of oyster sauce, 1 tablespoon of soy sauce, 1 tablespoon of sweet soy sauce, pinch of salt and optional pinch of MSG to the wok. Stir the mixture until a thick gravy forms in the wok. Taste the gravy and add salt or sugar to your preference. Once gravy bubbles, add the Chinese broccoli and stir until the greens wilts. Place fried noodles flat on a dish. Add 2 cups of the Meat/Vegetables gravy mixture on top of the noodle bed. Serve with pickled jalapenos, hoisen sauce and sriracha hot sauce. Mo's Birthday Feast" "Surf & Turf"